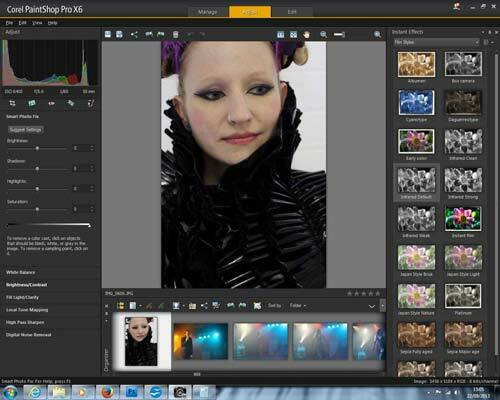 Corel PaintShop Pro X6 is the sixteenth version of the popular photo editing suite. Arguably the closest rival to Adobe Photoshop, PaintShop Pro X6 features a number of new features and plenty of enhancements. 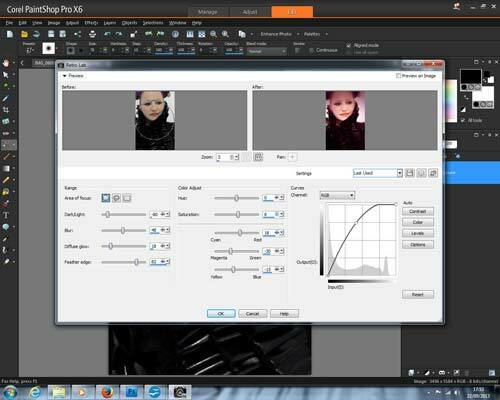 New features include 64-bit performance, Quick Selection tools and PaintShop Pro membership. Get the Ultimate version and also enjoy Reallusion FaceFilter 3, a collection of royalty free backgrounds, brushes and textures as well as PerfectlyClear from Athentech Imaging. For newcomers to the program, you can pick it up for £79.99 while the upgrade for previous users is £59.99. It's also available as a 30-day trial from the Corel website. Once downloaded, Corel PaintShop Pro X6 took around 5 minutes to install. However, as a review sample, we had to download FaceFilter 3 and PerfectlyClear separately. For Ultimate users, upon opening the program for the first time, you'll be able to download the extra features from the Corel website. You have to create an account and validate it using the email address, then you'll be taken to the download page. This is different to the Update page on the Corel website which can also be accessed through X6 under the Help tab in the top left corner of the window. 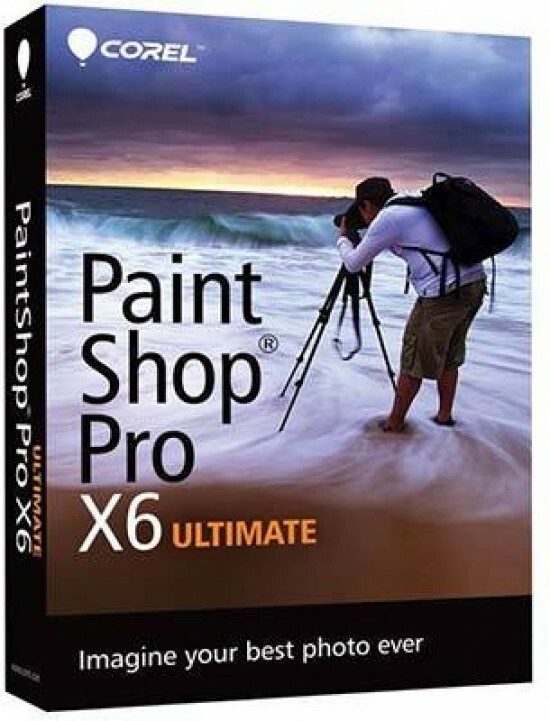 The layout of Corel PaintShop Pro X6 is the same as X4 and shows that it's a tried and tested formula that loyalists to the program are happy with. It certainly works well enough and gives more of a feel of Lightroom or Aperture than Photoshop. This is due to the division of the system. 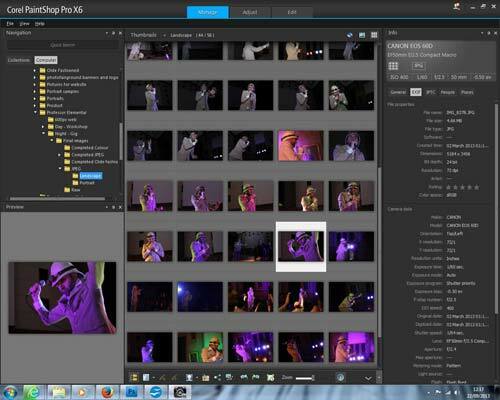 Corel have split it into three sections: Manage, Adjust and Edit. If you've read our recent review on PhotoDirector 5 from Cyberlink, it's essentially the same here. The Manage tab is used for importing images into the system, Adjust allows you to change the base elements of the image you've selected such as white-balance, brightness, clarity, tone mapping and noise. The Edit page is the page that's most similar to what users of Photoshop or GIMP will recognise. This is where you can be creative on a local scale. We'll break the review down into stages though, so it's easier to understand how it's been built. Importing images is arguably easier using the navigation tool below the File tab in the top left corner. It's more visual and you gave the ability to track yourself if anything goes wrong by seeing the path you've taken. It's split into two sections; Collections and Computer. To initially import images, you need to flick over to the Computer tab to find the files. The folder with pictures in will lay out as thumbnails in the main window with the picture you highlight showing in the preview window in the bottom left corner. You can zoom into the preview window if you want by placing the mouse over it and rolling the wheel. The Collections tab is for any images that you've labelled as favourites either with tags, date, names, star ratings or location data. It allows a quicker search of your favourite pictures. A search field also allows you to look for titles of pictures. Metadata about the photograph you have highlighted will show on the right side of the thumbnails. Once you've selected an image to edit, you can click over to the Adjust panel where the layout slightly changes. In the Adjust page, the preview window in the bottom left corner is now the main window with the thumbnails relegated to a ticker style scroller at the bottom of the page. The left side is dedicated to adjusting the base elements of the image from the brightness and contrast to tone mapping, clarity and noise removal. A histogram has been provided to help you get the perfect exposure. Of course, if we look at this with a keen photographic and creative eye, you shouldn't actually need the histogram. After all, photography isn't about a perfectly balanced and exposed image, it's about what looks right. However, it's there if you need it. To the right of the main window are a number of effects that you can apply to the pictures you highlight. They range from Artistic, through Black & White, Film Styles and Retro to Portrait, Landscape and Traditional. The most interesting one will tend to be the type of photography you're into. We like the Film Styles and Retro filters at the moment. If you apply a filter then change your mind, you have to undo that filter and try another because the system tries to blend them together. It's a great idea in principle because it's quite intelligent and does a good job. When you're having a browse through to see which you like, it can be time consuming.